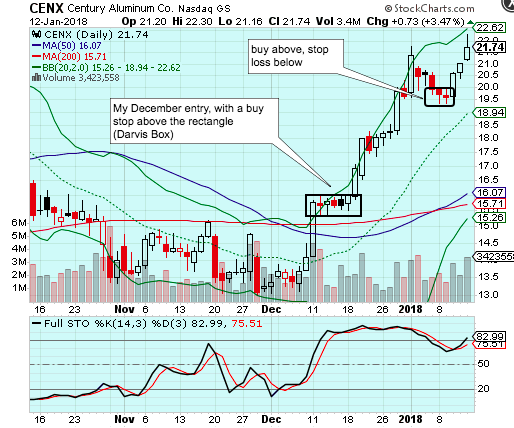 CENX popped up on the Top 50 Bullish scan on January 9th. So that immediately got my attention. Then I saw that it made both the Non-ADX Pullback and the 1,2,3, Bullish Pullback pattern as well an NR7 & an NR7-2 on the 9th. Either of those pullback patterns in combination with an NR7 is something I love to see, so I knew I had to take a swing at CENX the next day. I entered via my usual buy-stop order and just waited for it to trigger. As you can see in the chart I got in on the 10th and I remain in the position wth a trailing stop. I currently have about an 8% gain (just under 2R) after 3 days in CENX. A note on the position sizing / risk management of that trade: The textbook rules of the 1, 2, 3 Pullback says to buy 10 cents above the high on the 9th with a stop below the low of the day on the 9th. That would have me buying at or above 20.03 with a stop around 19.30. So that's a 73 cent stop. The problem with that is CENX's Average True Range is 92 cents -- so a less than normal fluctuation would stop me out. So I chose to make my stop a little wider, and set it to 1.00 with my buy-stop order set at 20.11. MNTA was the other standout for me last week. I wrote the Calm After Storm scan specifically to catch this type of action -- a big pop followed by a pullback and a narrowing of the daily range and ideally a reversal candlestick. 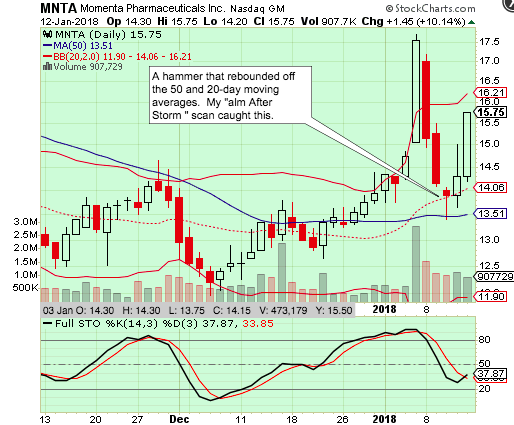 MNTA showed up on the "Most Bullish Alerts" scan on the 10th thanks to it making 50 DMA Support, Hammer Candlestick, Non-ADX 1,2,3,4 Bullish, and Calm After Storm. Again, I used my typical order to get in - a buy stop above the day's range on the 10th. I went with a 80 cent stop loss, so I'm currently sitting on approximately a 2R gain (13%) after 2 days.